Yes it's still little ole me, but as a lot has happened to me over the last 12 to 18 months in every way possible as much as I love my old blog it didn't feel right, and also with being absent from real crafting for quite a while I also felt a fresh start was needed. Anyway onto my first card for this new blog. It's my FiL birthday next week and I was getting a little worried as up until yesterday I hadn't had the chance or the enthusiasm to make anyso I thought I best get my crafting head on pretty sharpish. I sat at my PC all day friday trying to design 3 cards I had to make for my Fil and even when the clock hit after midnight I hadn't designed as single LO let alone card, then yesterday everything seemed to click into place I ddesigned all 3 and got them printed off for just after lunch. Then we had a visitor for an hour or so and after they went I got cracking onto making and by the time casualty came on I was 3 cards done and dusted and everything tidied away sorted!!! Just like all my other cards all the papers are freebies from blog trains and freebie sites I will try to set a page up with links as and when I get chance in case any one is interested in getting freebies. Hello my special friend, and look, I am your first follower. Well, I sure am glad that the CARD KITCHEN, (haha) is in full working order, and what a fabulous card to start it all off. I am so pleased for you my friend, and as you know, a change is as good as a rest, so here is your new start. I cant wait to see what recipes follow out of the Card Kitchen. Nice crisp feel to your blog site, hope your happy with it. Thanks for linking up your card with us today over at MSC. Card is great. Love the monochromatic blues! What a great card! Thank you so much for joining us at Sister Act! What a wonderful card! Thanks for sharing it with us at My Sheri Crafts. 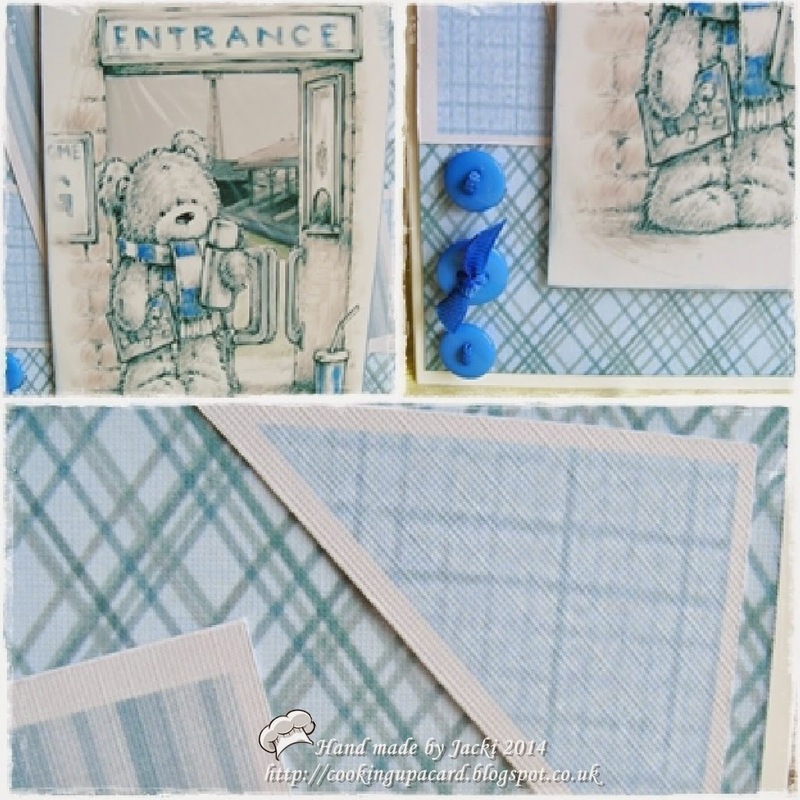 What a wonderful card you have created for our 'anything goes' challenge at Crafty Catz! Thank you so much for joining and I do apologise for my belated comment. Wonderful start to your new blog. GREAT card. I'm glad someone else can take HOURS to get nowhere! LOL I'm like that, then something happens like it happened to you and all is done and dusted. I think the word while thinking about a design is procrastination! at least that's what it seems like. Keep going and stay happy.